Running in Swiss Alps with my zipper open. My eternal quest for a waterproof running jacket continued in Swiss Irontrail 2015. 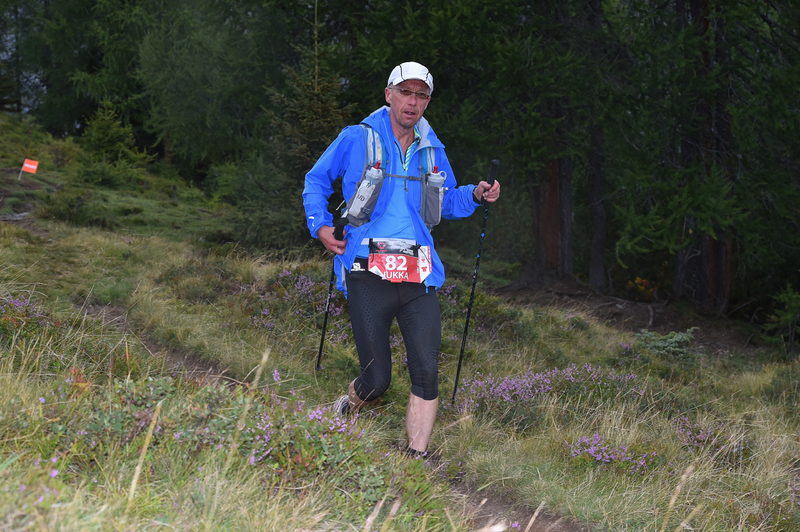 As faithful followers of this blog know, I've abandoned way too many ultra trail races after suffering from dire consequences of Alpine storms in so-called 'waterproof' jackets. Haglöfs Gram Jacket made of 3-layer Gore-Tex Active fabric proved to be the best jacket I've tried so far for demanding mountain ultra trail running. I found the fabric surprisingly breathable without condensation issues. As I understand it, this amazing material is made by bonding a teflon membrane on to both the inner lining and the outer fabric of the jacket. 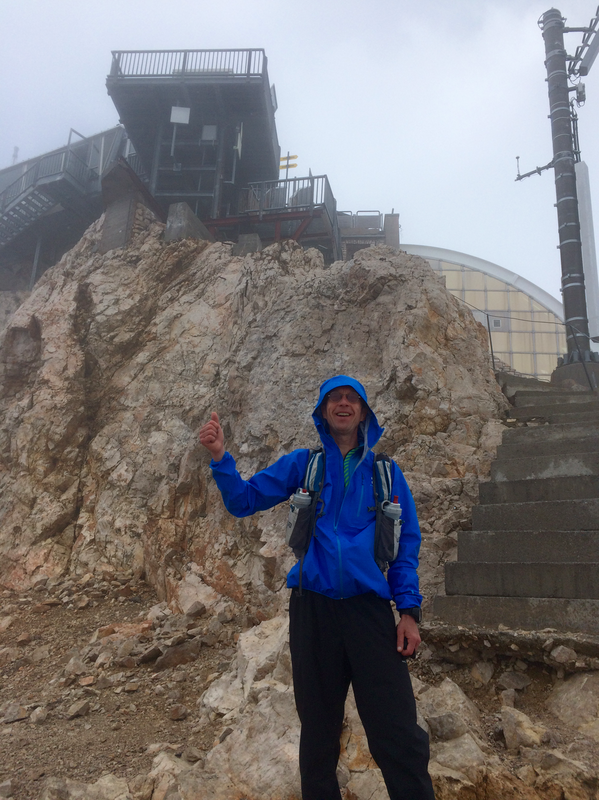 I scrambled a Via Ferrata through rain, hail and fog to the top of Zugspitze 2962m in July 2015 with a little help from Haglöfs Gram Jacket. Gram is also lightweight for a Gore-Tex jacket: my size M weighs 290 grams. More importantly, the jacket performed fantastically well when the going got tough. 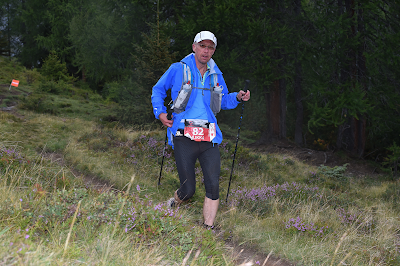 Like most Alpine Ultra Trail races, Swiss Irontrail is infamous for frequently challenging weather conditions. As the weather turned increasingly windy, wet and cold during my 204.2 km (as measured by ITRA), +11,500-meter, 55-hour adventure, this this jacket kept me dry, warm and comfortable. After long hours in pouring rain it remained 100% waterproof. I was initially attracted to the minimalistic design with an innovative pattern of construction, only one iPhone-size upper chest pocket, articulated sleeves with internal thumb loops, superb 3-way adjustable hood, waterproof durable zipper and reflective details. Haglöfs was founded in 1914 by Victor Haglöf in Sweden. Today it is the largest supplier of outdoor equipment in Scandinavia. Japan's Asics bought Haglöfs in 2010 for billion (1,000,000,000) SEK. The Gram jacket is made in 'South-Finland', ie. Estonia. Unfortunately I believe this model has been discontinued recently. Should you be interested in acquiring one, you may still be able to find great deals for this outstanding jacket that can be used for cycling and other aerobic outdoor sports as well. I paid under 200 euros for my 'over-200-km-jacket'. It was money well spent for a change. The secret leaks out, but this jacket does not leak. 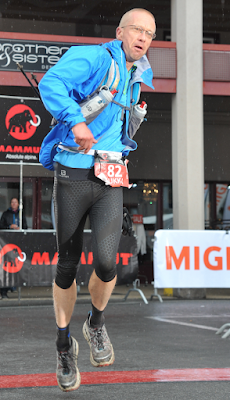 If this jacket got me to Swiss Irontrail finish, it has to be pretty good.